It’s late one night, and the farmhouse where Rex and Rion are sleeping is rocked by a massive explosion. They investigate and find — a tiny Tyrannosaurus! Well, tiny compared to its ancestors. The mini-dinosaur apparently has arrived in a hollow meteorite that landed near the house and, while Rex and Rion watch breathlessly, it morphs into a human being. “Holy moly!” cries Rex, cowering for protection under the long arm of his seven-foot-tall yeti companion, Rion. The two are inseparable. This is NOT your average children’s story. Instead, it’s the delightful and riveting tale of how a boy and his super-powered droid become friends with an interstellar intruder. But the story goes much deeper than that. Earth long ago was home to Menosaurs — just like the unfortunate refugee that Rex and Rion find on their farm. Tarok — the boy who can transform into a T-Rex — tells them that his ancestors — the Earth’s dinosaurs — were wiped out by a gigantic attack from space by the ancient enemy of Tarok’s people back on Prehistoria, his home world. The author goes to great lengths to reassure readers that Tarok and his people — er, dinosaurs — are friendly, and wish no harm to the citizens of Earth — which they said formerly was called Mordex. But, in another part of the book, we find that there ARE evil dinosaurs back where Tarok came from, and they’re about to come looking for him. And, in the process, they want to re-colonize Earth. To make matters worse, the U.S. military is actively searching the hills around Rex”s farm, hoping to find and “study” the unique creature. They don’t know yet that he’s just a small, scared boy — most of the time, anyway. This excellent book delivers a first-rate tale of boyhood bonding while peopling it with plenty of suspense, danger and, above all, a satisfying ending. 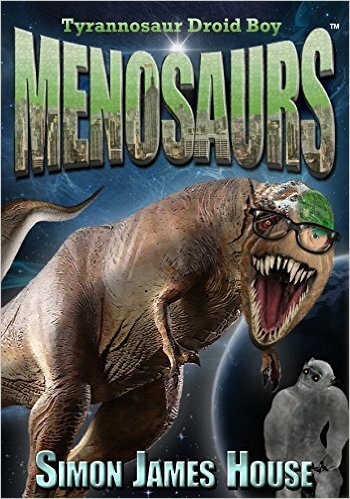 Five stars to Menosaurs. Read it as a tantalizing tale with your children. They’ll thoroughly enjoy the imaginative story. Tap the Follow button to receive a FREE ebook each day, plus more reviews by Don Sloan, This site contains more than 1,000 books in 11 genres, and is updated with new titles by 8 a.m. ET daily. I am a former journalist with a major daily newspaper and now am a full-time Indie book reviewer. I love to write, read, drink good wine, and take short naps in front of my fireplace here in the North Carolina mountains. Dog-Friendly Environments for Your Best Friend. This is a fictitious company.